FSSO is active in community outreach activities and we love the opportunity to work with the public. 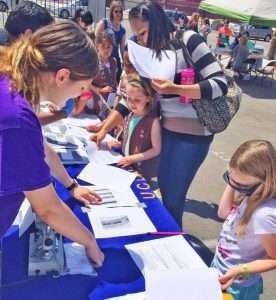 FSSO gives back to the community by visiting local high schools and Girl Scout troops as well as by participating in other community events. Each year the FSSO has a fundraising booth on Picnic day, UC Davis’ biggest annual event, to support the organization as well as to provide information about the master’s degree program to the public. Recently, FSSO representatives attended a local grade school event where young students were introduced to forensic science methods of evidence handling and evaluation. FSSO members set up mock crime scenes and encouraged students to solve the crimes by using the broad aspects of forensic science. Promotional materials are available upon request. Please feel free to contact us to inquire about further participation in community events. We would love to be involved!